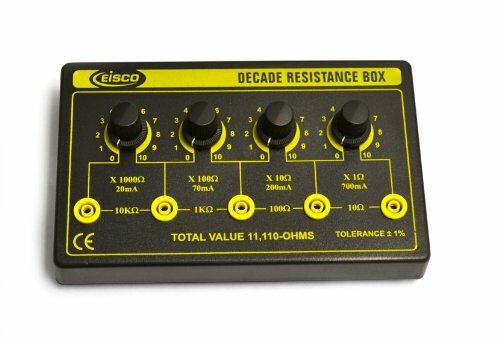 This decade resistance substitution box provides 4 decade ranges asgiven below and total value 0 to 11110 Ohms with a resolution of 1 Ohm. Each decade is selected using rotary switch. All resistance values are of ±1% tolerance and with 0.5 watt resistors, 0.5555 watts is the theoretical maximum. If you have any questions about this product by EISCO, contact us by completing and submitting the form below. If you are looking for a specif part number, please include it with your message.